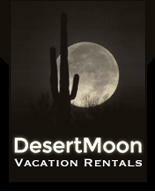 Desert Moon Vacation Rentals is owned by Architect and General Contractor, Maria Ruedinger and Interior Designer and Landscape Designer, Carla Kenworthy. Our properties are distinctive from one another, and carefully furnished for those wanting to stay in a uniquely designed yet very comfortable home. We take pride in the furnishings we choose, as each house is different and the furnishings must match the home. Each landscape is carefully designed to fit the architectural style of the home and offer our visitors a unique sensory experience of the Sonoran Desert flora and fauna. Our guests include those wanting to experience the Sonoran Desert, vacationers, adventure seekers, avid bikers, people here to visit family members or those wanting to purchase a home in Tucson, or those working temporarily in Tucson. We welcome them all! As residents of Tucson since 2003, we know the area well and can offer helpful information to those wanting to explore the many desert attractions in Arizona or learn more about a specific area. We are also Real Estate Agents, doing business as Canyon Group Realty. Quite often, guests come to our properties to stay while searching for real estate to purchase in Tucson. We have happily helped them find homes to purchase and in some cases also assisted with renovations and interior design. We keep track of the real estate inventory on a daily basis in order to best serve our clients. As a General Contractor and Architect, Maria can look at a property and provide the client with information about the construction, condition, and other issues that might affect price or buying decisions in order to best serve her clients. EVE Architects, our architecture and interior design firm, specializes in renovations, remodels, landscape design and interior design. We have completely gutted homes down to the bare bones and built them back up (see our Desert Cloud at Sabino as an example), re-landscaped several areas that were neglected and over grown with cholla and prickly pear, and turned them into park-like settings-filled with native yet unique desert botanicals, turned an old warehouse into a business for a pharmaceutical provider, designed a new clinic for a medical facility, and many interiors for countless homes. Maria also has the expertise to design and build a home from the ground up. One of her prize designs was a home built in the Arts and Crafts style. Carla has over 19 years of experience as an interior designer, designing countless residential projects and commercial design including restaurants, healthcare, libraries, corporate design, and educational facilities. She is a colorist by nature and an avid lover of the mid century modern aesthetic as well as the Art Nouveau works of Gaudi and Guimmard. In her spare time, she teaches upper level design courses for the Art Institute of Tucson since 2003. The Gear Group is our construction firm. As Maria is a licensed General Contractor, we work on our own projects (our vacation rentals) and are hired by others needing our expertise and our ability to stay on budget and on schedule. We have on hire, a team of sub contractors that have been trained well, have years of experience, and can do anything we ask! They build all of our design work, are a bunch of hard working guys and take supervision well in order to accomplish our vision and create happy clients.